As I was leaving Chinatown this afternoon after the fire, I had a chance to chat with one of the firefighters. He said there’d been a fire on the top floor, that it had not been too serious, and their quick response made a difference. 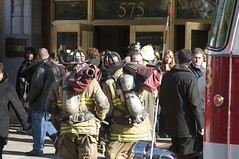 WJLA is reporting that the fire was caused by a torch and some insulation. A fire pump, however, ruptured during the event, flooding the lower level of the Crime & Punishment Museum on the same block.